When you cruise, do you like to go into the casino? Just to play the slots a couple of times, or bet on roulette two or three times - just enough to win enough for a couple of drinks? And who hasn't played a game or two of bingo on a sea day? Well, thanks to Carnival (Corp), now you can do that from the comfort of your own home - or anywhere you have your smart phone. And not only that but it may be even better because this app is filled with all kinds of cute and flashy graphics that even make it fun to watch the roulette ball spin around. But here's the best part - it doesn't cost you a-n-y-thing. Ah, but there's an insidious part to it too. Carnival Cruise Line released more revised itineraries today for their eastern Caribbean sailings that were to call on ports heavily damaged by Hurricanes Irma and Maria. Just as Carnival has been broadcasting, there are plenty of alternatives available. These sailing dates run into late December. Viking Ocean Cruises announced that Dr Anna Fisher will be the godmother of Viking's fifth ship, now to be named Viking Orion, which will debut in July. Dr Fisher is a chemist, emergency room physician and recently retired NASA astronaut, one of the “original six” women accepted into the NASA astronaut program in 1978. Photo courtesy of Viking Ocean Cruises. All rights reserved. May not be copied or used without express permission. 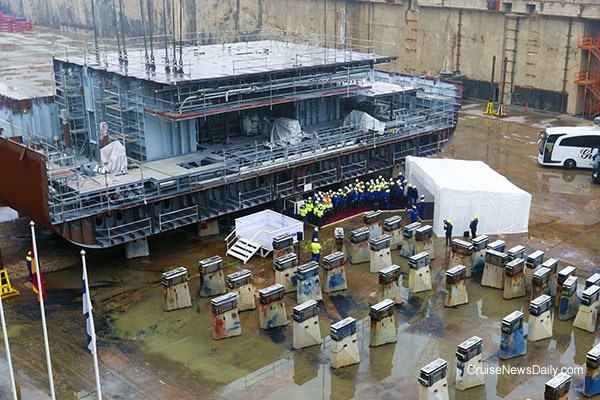 Mein Schiff 1 just floated out last Friday, and today Meyer laid the keel for Mein Schiff 2. Unlike on many of the Fantasy-class ships, the work on Carnival Elation was more than just cosmetic. Carnival added 38 new staterooms and added balconies to 98 existing staterooms. The complete story appeared in the October 4 edition of Cruise News Daily. The CLIA lines have set several new records in the US as the cruise industry continues to grow. In the US the cruise lines, passengers and crew spent a record $21.69 billion in US ports in 2016 in direct and indirect spending. This represents a 15% increase in just five years. Since fans of the Chicago Cubs aren't using that phrase anymore, Norwegian Cruise Line thought they'd use it in New Orleans. Next winter Norwegian will be replacing Norwegian Pearl with the 145,655-ton Norwegian Breakaway at New Orleans, the largest ship ever to be based at the Crescent City. 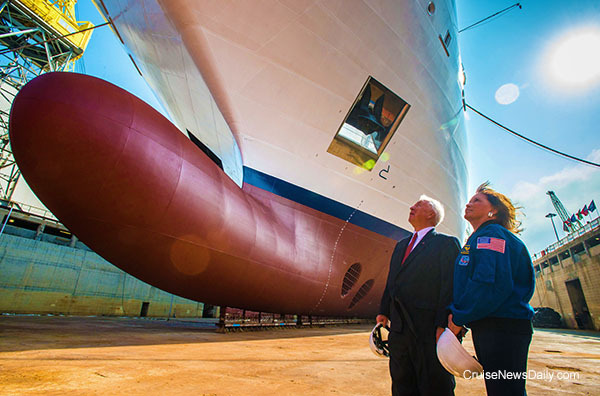 The 4,000-passenger ship will nearly double Norwegian's capacity at New Orleans. If the average person in America has been watching the news he or she knows there were hurricanes in the Caribbean, and they have seen the evening news anchor standing in the midst of what used to be someone's home saying there is complete devastation. So where should they go on vacation? There's no point in even thinking about the Caribbean, they reason. Who would want to cruise to a port like that? Well, Carnival is on a mission, according to their earnings call last week. They want to let everyone know that “the Caribbean is open for business and is going strong,” according to Carnival President and CEO Arnold Donald. The complete story appeared in the October 2 edition of Cruise News Daily. Details appeared in the October 2 edition of Cruise News Daily.